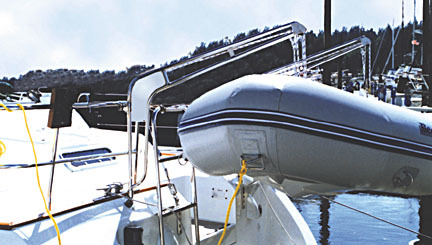 The Nova Davit™ Sailboat Davit system for inflatable boats represents the "State of the Art" for styling and function. 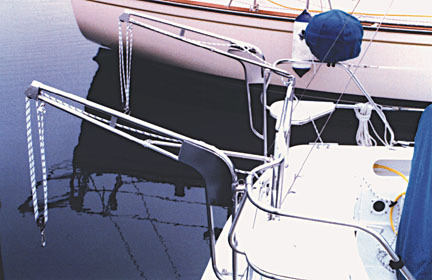 The Nova Davit is a versatile davit system for sailboats and powerboats. They are strong, attractive and offer a quick, simple installation, assuring a perfect fit with an offshore strength standard. 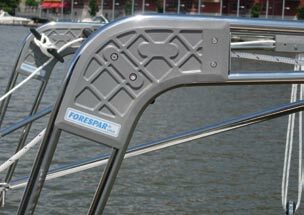 They are designed to lift your dinghy, without engine on, higher out of the water to help avoid swamping or loosing the dinghy when your boat is healed over under sail. The Nova Davit is designed offer the benefits of light weight and excellent lifting capacity and are designed for dinghies in the 6 to 12 foot range, subject to 350 lb max. weight restriction. All ropes, pulleys, struts, mounting clamps included. 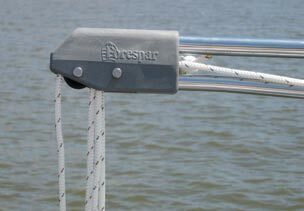 Nova Davit™ can conveniently fold inward, flush with boat stern, to maintain boat slip length or remove them completely for stowage or racing. Diagonal bracing struts for added lateral and outer end stability of davit system. Double sheave head is built integrally for increased strength, clean lines and light weight. 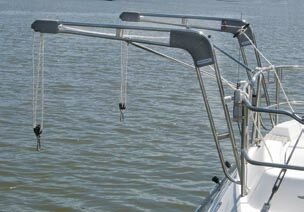 All 304 Stainless Steel Davits, with new attractive Lines. Fits rails 23" to 32" high. The maximum safe working load is 350 lbs. per pair - 175 lbs per arm. 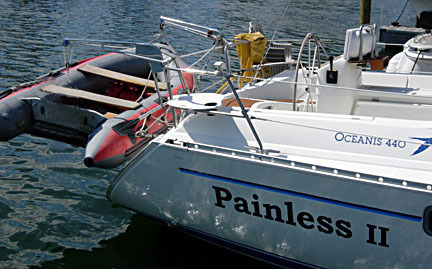 Important: Do not leave engines on dinghies hoisted on davits. 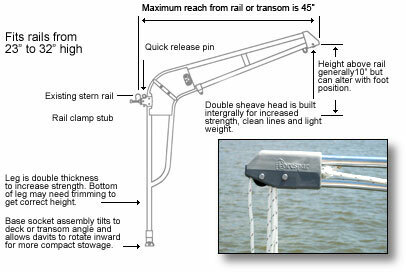 This weight overloads one arm and can lead to failure of davit arm and/or stern rails. Remove the engine before hositing dinghy. See these motor storage bracket options here. 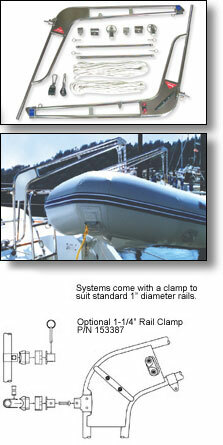 All Nova Davits & Nova Lifts come standard with 1" rail mounting brackets. If you have larger rails 1 1/4" brackets are available as an option at an additional cost. Be sure to measure your rails before ordering. The original brackets cannot be returned for credit.